Remember that odd plastic piece on the back of the Nexus 10? You could remove the part and replace it with a smart cover that remains physically attached to your device. Well, if you've wanted that same action on your Galaxy S III or Note II, now's your chance. Samsung's protective flip covers are going on sale. Much like on the Nexus 10, these accessories will require that a part be entirely replaced in favor of an always-attached case. Only this time, it's the battery cover. As you can see in the pictures above, this flip cover is embedded in the rear of the phone and folds over to cover the screen. It's a nice way to ensure your protection is never out of reach. On the other hand, you'll have to commit to having a flappy piece of plastic around whenever you use your phone. The flip covers are available for $39.99 or, if you buy your phones in bulk, you can also get two covers of multiple colors for $49.99, or four for $99.99. Update: It looks like these covers have been out for a while. The color bundles are new, however. DALLAS--(BUSINESS WIRE)--Samsung Telecommunications America, LLC (Samsung Mobile) – the No.1 mobile phone provider in the United States1 – is giving U.S. Galaxy Note II and Galaxy S III users the ability to customize Samsung’s newest iconic smartphones with its Protective Flip Cover, a unique case solution available in an array of vibrant colors. 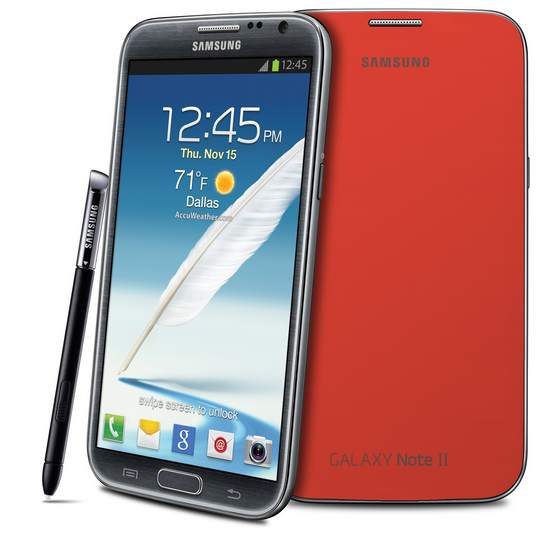 In addition, Samsung Galaxy Note II and Galaxy S III owners will be able to purchase bundles of Protective Flip Covers in multiple colors at a discounted price. The Galaxy Note II Protective Flip Cover is available for $39.99 each at Samsung.com, and is also available in multicolored bundle options of four covers for $99.99, or two covers for $49.99 on Samsung.com. Galaxy S III Protective Flip Covers are currently sold separately for $39.99 and will also be available in multicolored bundle options for $99.99 (four colors) and $49.99 (two colors)2. Samsung, Galaxy Note, Galaxy S and HD Super AMOLED are all trademarks of Samsung Electronics Co., Ltd. Other company names, product names and marks mentioned herein are property of their respective owners and may be trademarks or registered trademarks.